Page under development. If you have suitable content for it, please get in touch. Little information is available about the ice conditions on Swampy Summit. The first report we have is from September 4th 2010, indicating that some ice was present but insufficient to skate on. The temperature in Dunedin was 8 deg. C and there were no sign of frosts in the city even in the highest suburbs. The temperature on Swampy Summit was zero deg. C. The road was frozen solid. All puddles were frozen and some ponds had a 4 – 5 mm thick layer of ice in sections. All larger ponds were totally liquid. 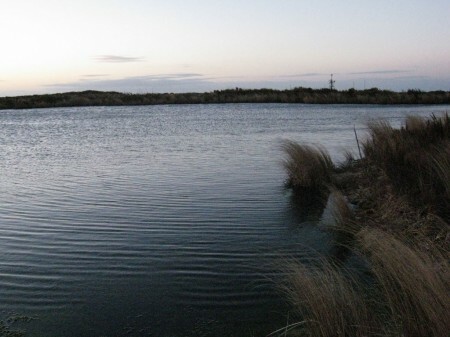 The wind and swampiness of the larger ponds may prevent them from freezing, but this is unknown at this time. Investigation in extreme winter conditions is necessary to confirm whether it is viable to skate there. The second report we have for this area was from July 13 2011. The larger ponds were not inspected, but a small pond off the side of the access road had ~40 mm of soft snow ice. The outer edges of the pond were very weak and a plank was used to get onto the ice surface. Ryan Hellyer drilling the ice, July 13th 2011. Photo courtesy of Dave Patchett. Ryan Hellyer on the ice, July 13th 2011. Photo courtesy of Dave Patchett. Ryan Hellyer skating on Swampy Summit, July 13th 2011. Photo courtesy of Dave Patchett. One of the larger ponds on Swampy Summit. Photo courtesy of Ryan Hellyer. Photo taken on September 4th 2010.